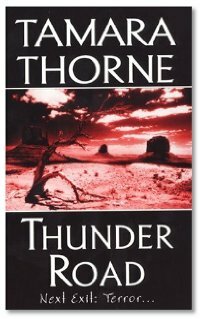 Tamara has released her latest book, Thunder Road. Well known for her horror and ghost stories, Tamara blends her traditional fare with UFOs, cults and serial killers. And speaking of ghost stories, she's collecting real-like stories for an anthology. Got any to share? Russel has recently released his second novel, A Bowl of Fruit, A Whale in the Woods. This odd sounding book deals with a cast of eclectic characters traveling through paintings to access alternate reality. Why? To save the universe, why else? An enjoyable, funny book! Little different this week kids. Spiderman India. Good idea or bad? You be the judge. A number of years ago, you interviewed me about my second book, "A Bowl Of Fruit, A Whale In The Woods" ( see http://www.dragonpage.com/2004/06/28/cover-to-cover-120/ ). Now I am working on another book,, "Prehistoric Pets." I am using Kickstarter for this project, and my Kickstarter page is active until December 25, 2012. You can view my Kickstarter page at http://www.prehistoricpetsbook.com . Since you have been interested in my work in the past, I thought you might like to hear about my current project.